On Page SEO: Optimizing code elements that search engines use to understand your page. Off Page SEO: Increasing a page’s rank in search engines because of it’s perceived value in a community. This perceived value leads to other sites linking, sharing or referring to your page. The difference between on page and off page SEO is that on page SEO refers to optimizing page code elements, while off page SEO is about promoting value. The difference between on page and off page SEO comes down to control. In on page SEO, you can target a search term through keyword research, create a page, and tweak the content for the best results. You have complete control over your optimization efforts. Off Page SEO is different. It relies more on promotion. These include link building, blogging, social media, and other off page SEO techniques to build awareness. Control is in the hands of your community. Let’s get into the mechanics of on page vs off page SEO. On page SEO starts with keyword targeting. Once you’ve honed in on your target keyword, you can use it to optimize on page elements. There are two parts of on page optimization to keep in mind. The first are meta tags. These page elements are within the <head></head> section of your page. It’s information visitors won’t see directly on your page. Search engines use this information to display your result. The second part of on page SEO is to optimize visible page text. This information falls under <body></body> tags. It’s the actual content on your page. These are the basic mechanics behind on page SEO. It’s the starting point of improving organic search engine rank. Now let’s shift focus to off page SEO. Off Page SEO techniques have to do with promotion. The goal is to increase visibility so members of your community share and refer to your page. The goal of link building is to increase the number of quality backlinks to your content. Email Outreach: Sharing your valuable content with other members of your community. Highlight your content’s value, and in return, you may receive a reference back to your site. Guest Blogging: By guest blogging, you can share your knowledge on a particular subject, and include a link to your own content for reference. Feedback Submission: Reporters and bloggers looking for expert feedback are a great linking building opportunity. You can sift through these opportunities using services like HARO or SourceBottle. Your blog platform lets you discuss ideas with online communities. Providing useful information makes visitors think of you as an authority. This means they’ll return to your blog, engage with your ideas and share your posts. Social platforms are an easy way to share site content. And by promoting your content across a few major platforms, you can reach a lot of users. To get the best results, use on page and off page SEO techniques together. Think of these techniques as a process. 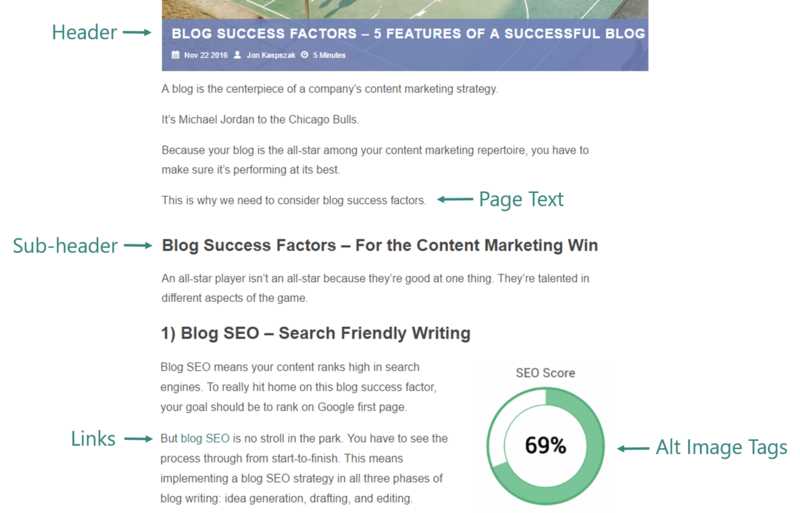 Start improving SEO rank by optimizing page content. You have control over this SEO process. So test SEO scores until you’ve given yourself the best chance for high ranks. Once you’re happy with on page optimization. Start promoting your content. Reach out to your community, share ideas, and promote pages across social networks. Promotion leads to more community members seeing the value you offer. This generates backlinks and engagement. You now have the blueprints for search engine optimization. Use both on page and off page SEO techniques to reach the top of search engine results.